This used to be my work local many many moons ago. I cannot remember the last time I visited but it’s at 15 years ago maybe even more! A Samuel Smiths pub and as in the norm all of drinks are from their own range, very pleased to drink and of report that the Sovereign bitter was on good form. One of my favourite ales, not the most exciting but always dependable. Busy inside and out, barely a standing space inside and no seats outside available, the weather was good but being a Sam Smith’s pub it’s the price of the drinks that will bring and keep punters here as it’s cheap for Central London. Good attentive and quick service, nice untouched décor, good location and good ales….what is there to complain about with the Crown. Cosy, relaxing atmosphere with efficient and friendly service. Excellent value and quality food. Usual wide range of Sam Smith's beers. A must visit when in this area. 10/10. Went to the Crown yesterday afternoon and evening. A no nonsense traditional pub that doesn't have to advertise on a-boards outside that it is a traditional pub. Went to the Princess Louise nearby afterwards too for a look at something more ornate. 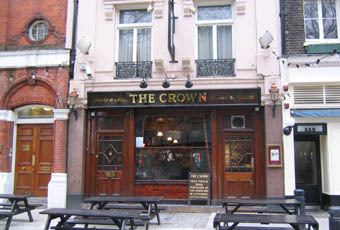 I'd happily return to the Crown when in London. Pleased to say I popped in Yesterday afternoon and this hidden gem is back to its best,great service,great landlords and always a good atmosphere...go there! Oh and the grubs good to. We went into this pub on Friday and want to say that the lady behind the bar was so kind and friendly to some of my friends who struggle to speak English. There were 12 of us and she called the Spanish barman (hot!) from upstairs to come downstairs to serve us. We sat outside and came inside later. There are few places in London where we can sit outside and enjoy the weather (when it's good). We are students and think this place's prices are reasonable (used to be cheaper, but hey! London isn't cheap). We are going back to the pub on Friday night.